They are a classic gone modern, the ripped jeans. You can find them in any style and color of denim, and you can combine them for a look for every occasion or season. They’ve been around for a while, a year or two at least, and we don’t see them disappearing any time soon. 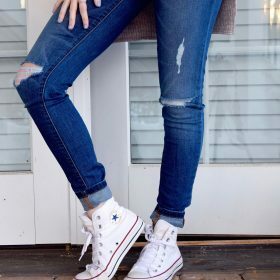 Every season we see alterations to the original ripped jeans, but they continue to star in the bottoms section. They’re easy to style, just choose what fits your personal style best. If you’re a casual kind of girl, go for a light pair with a white or grey t-shirt, throw a bomber jacket into the mix and finish with some cool sneakers. If you’re interested in something a little bit fancier, go for a darker pair with a striped top, a black or bordeaux knit cardigan and finish with some killer heels. Choose your favorite and style away!